Koottu is the name given to mildly spiced boiled mixed vegetables, and is usually prepared as one of the side dishes in an elaborate feast. With the addition of dal (lentils) it becomes a course in itself when served with rice. The spices are usually fried and ground with coconut and thus it is also known as Poricha (fried) koottu. 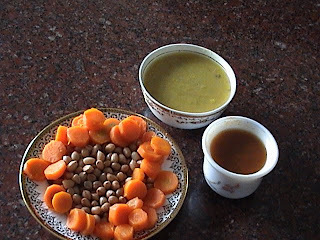 Koottu can be prepared with assorted mixed vegetables, such as carrots, beans, peas, chow-chow (marrow), cucumber and so on. The sight of so many varieties of fresh vegetables soon after returning from the green grocers inspires me to prepare koottu. The same feeling takes me over when I see the itsy bitsy left over vegetables at the end of the week! Koottu can even be prepared with any one vegetable. Since raw green papaya was abundantly available in our garden we were treated to papaya koottu very frequently. 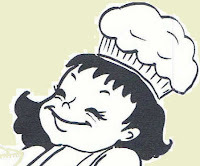 We children and our great grandmother loved the dish very much as it was not very hot or tangy. It was very gentle on our palates, especially when it was prepared with half ripe papayas, which lent a sweet taste to the koottu. We ate and ate the koottu and ripe papayas until we developed an aversion to it, which of course lingered only up to the next season. Koottu goes very well with chapattis, poories and rice. Here are three variations. 1. Wash and tur and mung dals. Cook until soft and mushy with turmeric powder, in 3 glasses of water and set aside. 2. For the spice paste, heat oil and drop in asafoetida, black gram dal, cumin seeds followed by red chilies and fry them till they are reddish in colour. Fry carefully on low flame, till it emanates a pleasant aroma. 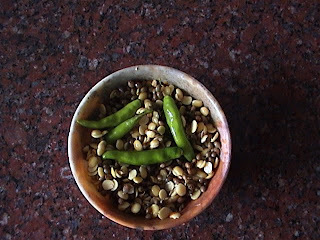 Do this carefully, browned dals loose their flavour and become bitter. 3. Grind the fried ingredients with grated coconut, and set the spice paste aside. 4. Cook the vegetables, along with the previously soaked chana in a vessel with just enough water. 5. When the vegetables and chana are are done, add the mushy dal mixture, salt and the spice paste and stir well. 6. Bring to a boil (2 to 3 minutes) and remove from flame. 7. For seasoning, heat oil and add mustard seeds to splutter; then add the black gram dal and red chillies. When the seasoning becomes red and crisp add curry leaves and pour the whole seasoning into the koottu. 1. Soak the split Bengal gram dal in water for at least 20 minutes until soft. 2. Grind the ingredients for the spice paste viz. green chillies, grated coconut and cumin seeds with a teaspoon of rice flour and keep it aside. 3. Cook cut vegetables and the soaked split bengal gram dal in enough water. 4. When the vegetables and dal are soft, add the ground spice paste and salt and boil for 2 – 3 minutes until till every thing blends. 5. Season with mustard seeds, black gram dal and curry leaves. 1. Take dal and turmeric powder in the separator of a pressure cooker, add 3 cups of water and set it in the pressure cooker. 2. Arrange the cut vegetables in another separator and sprinkle the sambar powder, and set it above the dal separator. 3. Close the lid, and place the weight and pressure cook until 3 whistles. 4. Switch off the flame and allow it to cool. 5. Coarsely crush pepper and cumin seeds with a mortar and pestle, and keep it ready. 6. Open the cooker and take out dal and vegetables, and pour them into a vessel. 7. Add salt, asafoetida, crushed pepper and cumin seeds and boil for 3 minutes. 8. Remove from flame and season with mustard seeds, black gram dal, broken red chilly and curry leaves. Enjoy the cooker koottu with rice or chapattis. 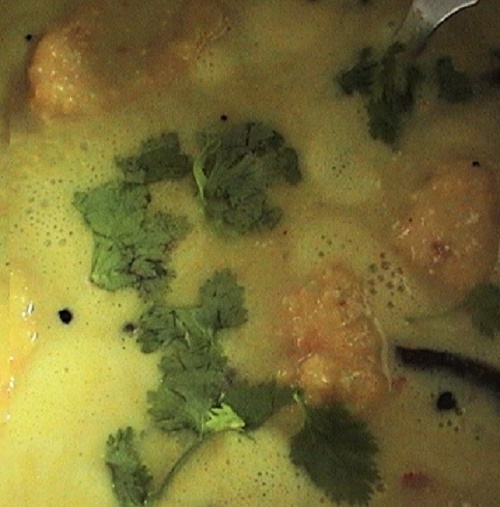 Mor means curd in Tamil, and Kozambu means gravy or thick soup. The basic ingredients for Morkozambu are curd and spices. The dish is tastier if a slightly sour curd is used. Watery vegetables like cucumber, chow-chow and ash gourd lend a special taste to Morkuzambu. Vegetables like okra, brinjal, and capsicum can be sautéed and added to the kozambu. Cooked drumsticks can be added for a special flavour. Tubers like colocasia are also used. Vattals or Sun dried vegetables are another option. You can fry them and add to this kozambu. Morkozambu always brings back memories of an incident during my childhood. My Pati (grandmother) used to prepare excellent ash gourd Morkuzambu. I was about four years old when I sat down for lunch with my mouth watering for the dish, she also served roasted potato curry with it. All hell was let loose and I started howling and howling. I loved to eat both the dishes with rice. But as I was very young at that time, I could manage to have only one course per meal. My Pati burst out laughing when she learnt about my predicament. After much persuasion, she finally helped me ‘tic-tac-toe’ and I decided to have the morkuzambu with great relish! 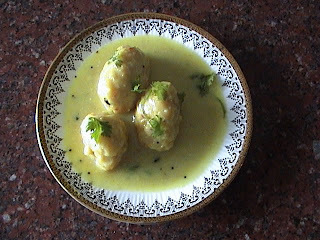 Paruppu urundai (lentil dumpling) morkozambu is a specialty. Serve it with hot steamed white rice and a dollop of ghee. Here is how we prepare it. Soak the dal and red chillies for 40 minutes. Drain all water and grind coarsely with asafoetida and salt. Take the coarse mixture and shape into small dumplings. Steam them in a pressure cooker for 10 minutes without the weight. Except for coconut and chillies, soak these ingredients in a little water for 20 minutes. Grind all the ingredients with the chillies and coconut to make a paste. 1) Blend the spice paste into the sour curds, along with salt and turmeric powder. 2) Now we have to add the seasoning. Heat oil and add the mustard seeds. When the mustard splutters add fenugreek seeds and red chillies. When the fenugreek turns reddish and aromatic, switch off the flame. Add curry leaves while oil is still hot, and pour this seasoning into the spiced curd. 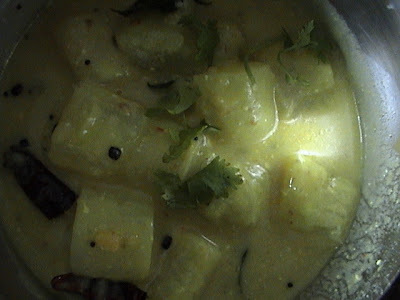 3) Blend the curd mixture (kozambu) well and place it on a low flame. 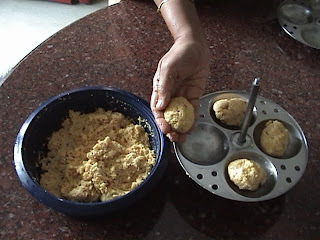 4) Next, add the paruppu urundai (steamed lentil balls) into the kozambu without breaking them. Note: Cooked vegetables or sautéed vegetables can be added instead of the urundais for a vegetable morkuzambu. 5) Cook until the kozambu bubbles, gently stirring now and then. 6) Remove from the flame before it boils. 7) Garnish with fresh coriander leaves and serve with steamed white rice and a dollop of ghee. 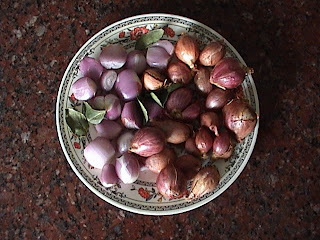 A great many varieties of Kozambus (thick gravies) are served with rice as the first course of a meal in all South Indian homes. 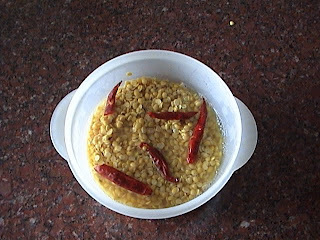 Kozambus with dal, without dal, with tamarind, without tamarind and even without either, are the many varieties served as a routine. 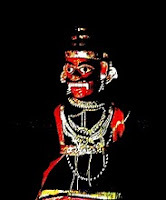 Among all of the kozambus, Sambar occupies the first and foremost place. 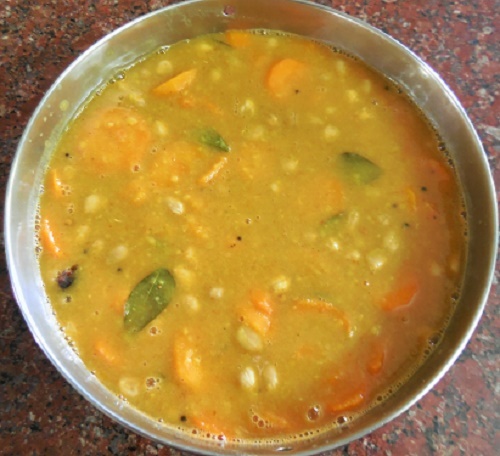 Sambar is prepared by cooking dal and vegetables in tamarind juice and spices. prepared for special guests. Onion sambar is prepared in all restaurants and served along with idlies, dosas and vadas. Vadas soaked in sambar is a connoisseur’s delight. We took our friend’s family for a treat to a restaurant which was famous for its mouth watering Masala dosas and Basundi (milk sweet). My friend’s 3 year old daughter was bowled over by the taste of the sambar, served with the dosa. We were all awe struck to see the little girl slurp cup after cup of the spicy hot sambar as though she were relishing a cup of ice cream. Now restaurants usually serve an extra cup of sambar free of cost on request. Watching cup after cup disappear, my husband assured the flabbergasted waiter that he would pay for all those additional cups. The poor waiter finally looked greatly relieved! Tamarind - enough to roll into the size of a small marble. 1. Soak tamarind in a cup of hot water for 15 minutes, and extract the juice. 2. Peel the baby onions and keep aside. 3. Pressure cook tur dal with turmeric powder and 3 cups of water until mushy, and let it cool. 1. Heat ¼ tsp of oil and fry the asafoetida. 2. Add black gram dal, bengal gram dal, coriander seeds, fenugreek seeds and lastly the red chillies, and roast till crisp and golden in colour. 3. Dry grind all the roasted ingredients. 4. Now add the dry coconut gratings and grind again with some water and keep the paste aside. 1. Heat the remaining oil and add mustard seeds followed by curry leaves. 2. After the mustard splutters add the peeled baby onions and stir. 3. Cover with a lid and cook on low flame. 4. When the onions are done and look glassy, pour in the tamarind extract. 5. Add salt and cook for for 5minutes on a medium flame. 6. Add the cooked dal and stir well avoiding lumps. 7. Now add the ground sambar masala paste. If the masala is too thick, you can dissolve it in ½ cup of water and then stir it in. 8. Let the sambar boil for 2 more minutes until all the ingredients blend together giving out a very pleasant aroma. 9. Garnish with coriander leaves before serving. Enjoy baby onion sambar with rice or any other dish of your choice.